Boston University’s first spirit week took over campus last week, offering a wide array of activities including Residence Hall Association (RHA) carnival events, a pep rally and lacrosse game and a Mr. and Mrs. BU pageant. The RHA hosted a carnival on Thursday that consisted of nine separate events such as: pie your RA, mini golf, and popcorn and Polaroids, among others. The events were meant to foster a greater sense of community on campus and encourage school spirit throughout. Some, like Gonzalo Zeballos, vice president of the South Campus RHA and host of the free henna and Ben & Jerry’s portion of the carnival, felt a need for such activities. Spreading the treats and the message quickly, RHA ran out of ice cream way before its scheduled end, revealing a general sense of good spirit and camaraderie. Down the street at Warren Towers the Spring clothing swap was another event designed to boost school spirit. Residents were asked to donate clothes and for every article of clothing donated a ticket was earned to get a different article of clothing at the swap. “I think it’s a really nice way to donate clothes for each other and for organizations like Goodwill,” said Joy Wang of the Warren Towers’ RHA. “I think [Spirit Week] is helping…You don’t have to be living in that certain place to go, and so you can get to know other people, and that’s a way to spread the spirit of BU,” said Wang. Despite the low turnout, with about 10 people in the room at a time, those who showed up co-mingled and seemed to have had a good time. The week’s festivities culminated with the Mr. & Ms. BU pageant on Friday night, held at the Jacob Sleeper Auditorium inside the College of General Studies (CGS). 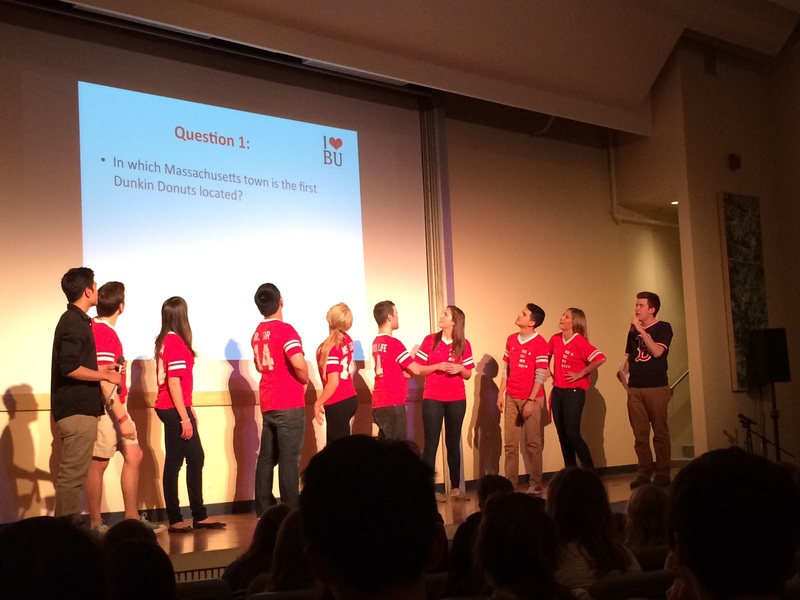 Couples from a participating colleges and student groups competed in a multitude of games, including a trivia game about Boston and a blind taste test hosted by BU’s Dining Services, as the audience cheered them on. The night was all about fun and friendly competition, adding to the overall atmosphere of school pride. It was also the first year the Mr. and Ms. BU competition involved student clubs, instead of just school representatives. “It was really fun, and it was my first time going to an event like this, where there was a lot of school spirit,” said Alejandra Cambonchi, a junior in the College of Engineering. The night ended with Bryan Cosca (ENG ’14) and Trisha Serquina (ENG ’15) of the BU Filipino Student Association winning the title of Mr. & Ms. BU 2014, with Cory Azmon and Sarah Jasper from the School of Education (SED) as runners up. Even though a majority of students didn’t know what Spirit Week was, localized events like the Spring clothing swap and larger events like the Mr. and Mrs. BU pageant helped spread the word and change things little by little. Overall, it was a good start to foster school spirit.